Compared to some of its fellow Italian rivals, the Cinelli Saetta Radical Plus is the dark, brooding one in the corner. The all-black frame and hard-to-see decals are in stark contrast to the can-we-fit-our-name-in-anywhere-else paint jobs from the likes of Colnago, Pinarello and Wilier. It’s so subdued, in fact, that you wonder how the bike could possibly feature the word ‘radical’ in its name. Look closely, though, and the bike has plenty to say for itself. The frameset is really beautifully finished in matt black, and the aforementioned decals are in gloss. In the right light, these shine out. Some might say that if you spend two grand on a bike it should be more bling, but there’s as much a place for this as there is for wild extravagance and fluorescence. It’s all down to taste. The top tube is noticeably slim in the middle, which Cinelli has designed to minimize weight but retain strength. This tube flows into the seatstays, a look which is mirrored from the down-tube and through the bottom bracket into the chainstays. Side-on, the frame looks very sleek. Immediately, we were very impressed with the comfort of the Saetta, which helped to smooth out some of the rougher tarmac offered up on Britain’s roads. It does this with no compromises, the bike feels good on descents, on the flat and climbing — if that sounds like faint praise, it isn’t. 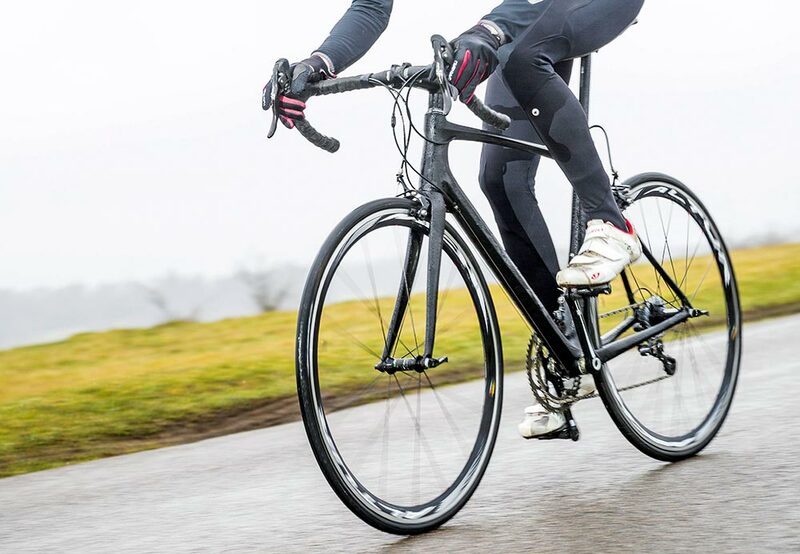 This is an all-rounder that could just as easily suit a sportive as it would a road race. We would say that the bike’s gearing possibly more leans towards the latter with a 52/39-tooth chainset and 12-25-tooth cassette, though. Cinelli has specced a full Campagnolo Athena groupset, including the chainset and brakes. 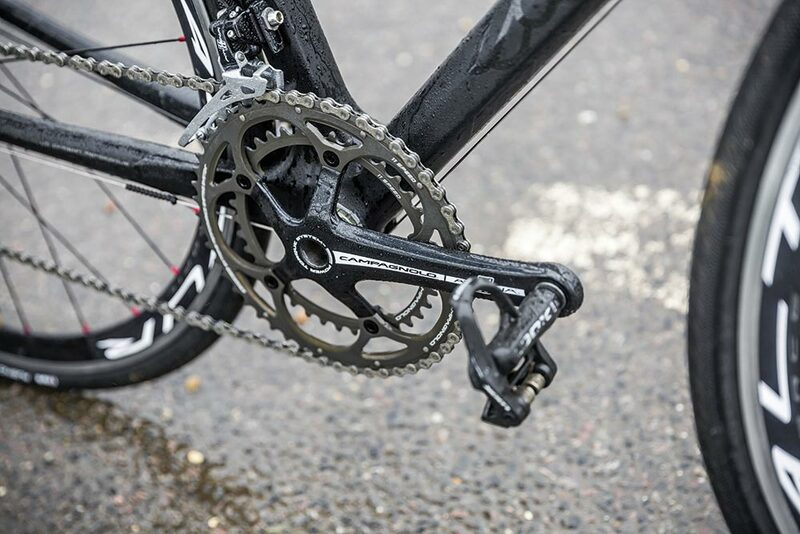 This no doubt helped the smooth-running of the drivetrain, which did not suffer from the dropped chains we have found on bikes equipped with FSA chainsets and Athena. We also liked the Miche Altur wheels, which were fitted with Vittoria Rubino Pro tyres in 25mm rather than 23mm width. Though the extra air volume is small, there is an element of comfort and security with wider tyres that many riders are currently switching to. 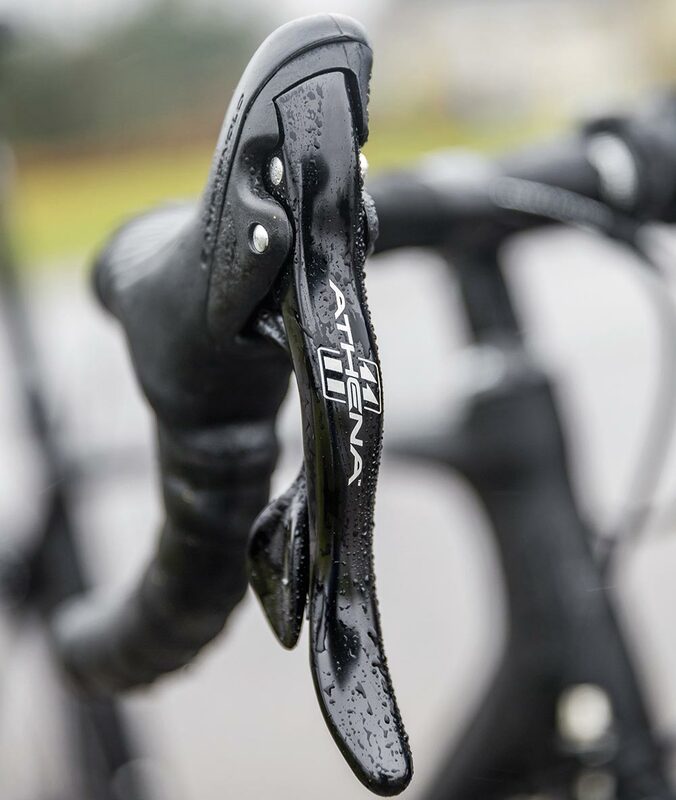 Cinelli is well known for its handlebars and stems, so it’s no surprise to see the company’s own DNA models present on the bike alongside a DNA seatpost and ubiquitous Selle Italia X1 saddle. All good. With a full Athena groupset and a good quality parts package, you would expect the all-in weight of the Saetta to be competitive — and it is. At a shade over eight kilograms, the bike compares well with its rivals. If you’re in the market for an Italian bike you might want something slightly more visually exciting, but the Cinelli’s subtle looks belie a great all-round machine that has little compromise on its spec sheet and performs really very nicely. Forget about the bling and enjoy the ride.